It’s not that I didn’t like The Lies of Locke Lamora, it’s just that I was expecting so much more from it. I found it to be well written enough, but I felt the ‘then/now’ structure of the plot bogged the story down, and for some reason I found I was sympathizing a bit too much with the character’s Locke was trying to cheat, which made it hard to root for him. If I had of picked it up having never heard of it before I think I probably would have really enjoyed it. But every reader knows how that goes. It’s the curse of the hype machine. We talk a lot about how a book that has been raved about all over the place often doesn’t live up to expectations. But of course, the flip side of this is also true, and while the hype machine worked against me with The Lies of Locke Lamora, it’s also one of the reasons why I enjoyed the sequel so much. 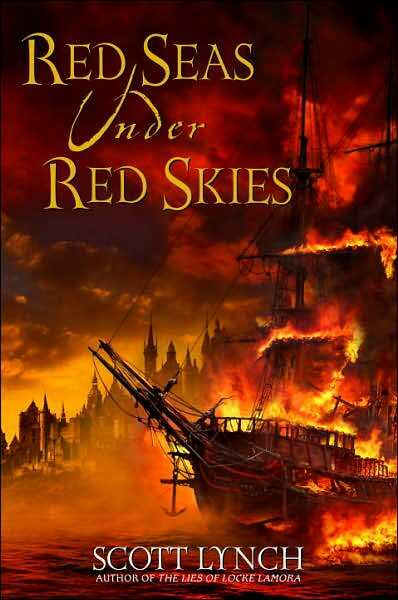 Red Seas Under Red Skies was not received nearly so well as The Lies of Locke Lamora. It wasn’t hated or anything, but general consensus seemed to be that it was not nearly as good as it’s predecessor. I think it’s an unfair assessment. 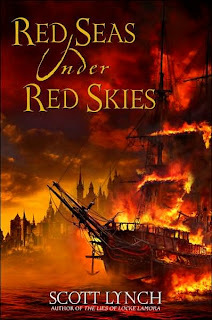 Red Seas is not at all a poorer book than Lies. It’s written with the same skill and flair, that kind of writing that seems tricky and effortless at the same time (like a well executed card trick), and was the one thing I really liked about Lies and the reason I gave it’s sequel a try. But the problem is that it’s a very different beast to Lies. It’s a lot darker, for a start. Gone is the plucky, cocky, supremely confident Locke who charmed over so many readers in Lies. But come on! Of course he’s gone! What kind of man would Locke Lamora be if the events at the end of Lies didn’t have a marked effect on him? The Locke in Red Seas has had his confidence rocked. Although he doesn’t come right out and admit it to himself, he’s relying far less on his cleverness and far more on Jean’s muscle. Which isn’t to say Locke’s been beaten down! I mean, a Locke Lamora running at half strength can still run circles around pretty much everyone, and I don’t think I’ll ever get tired of people underestimating him and not realizing their mistake until far too late. He’s just more subdued about it. Less brilliant for the sake of being brilliant, more aware of his own fallacies. He also learned the important lesson that bullshitting can only get you so far. I appreciated this Locke much more than I did the Locke in Lies. The before/after structure is mostly done away with here as well, which was definitely for the best. There is a little of it, but instead of flashbacking to Locke’s childhood we only go back to the months following the end of the last book (Red Seas being set about 2 years after), and the flashbacks provide hints and clues about what’s happening now. The flashbacks in Seas feel much more integral to the plot, and less like annoying detours away from the main story. I liked the sudden turns in the plot, and the way other characters were allowed to be clever too. I liked that the people Locke was trying to cheat this time around were a lot easier to root against, and I like that Locke and Jean’s friendship took a real battering. I also really liked the ending. And by really liked, mean really, really, hated. But it’s the good kind of hate. The hate that makes you scream in frustration and immediately run to the internet to find out when you can get the next book and find out what’s going to happen. (Because seriously, what’s going to happen?! I need to know!) I’m definitely glad I held off on this book until now; a year or so wait still seems impossible, but it’s definitely better than the five years every one else has suffered through!